Astronomical School’s Report publishes review and original research articles in astronomy, astrophysics, space geodesy, aerospace remote sensing, geoinformatics, history and teaching of astronomy and geodesy. 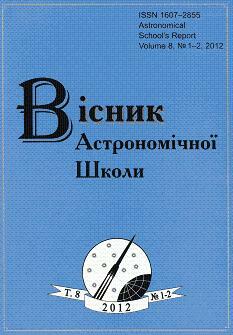 The journal is published by the Department of Aerospace Geodesy of National Aviation University (Ukraine), Institute of Astronomy of Kharkiv National University, National University “Lviv Polytechnic”, and with a support of Ukrainian Astronomical Association. Astronomical School’s Report is an open access journal. Periodicity of the journal is 2 issues per year (October and December). All scientific articles submitted for publication in “Astronomical School’s Report” are double-blind reviewed by at least two specialists appointed by the Editorial board: one from the Editorial Board and one independent scientist. Authors submitting articles for publication warrant that the work is not an infringement of any existing copyright and will indemnify the publisher against any breach of such warranty. For ease of dissemination and to ensure proper policing of use papers and contributions become the legal copyright of the publisher unless otherwise agreed. The Editorial Board of “Astronomical School’s Report” follows the rules on academic writing and academic ethics, according to the work by Miguel Roig (2003, 2006) “Avoiding plagiarism, self-plagiarism, and other questionable writing practices. A guide to ethical writing”. BY-NC-ND 4.0. This licence allows users to copy and to redistribute the material in any medium or format. The licensor cannot revoke these freedoms as long as you follow the license terms. You must give appropriate credit, provide a link to the license, and indicate if changes were made. You may do so in any reasonable manner, but not in any way that suggests the licensor endorses you or your use. You may not use the material for commercial purposes. If you remix, transform, or build upon the material, you may not distribute the modified material.